A record of spinning string. Made with a newly constructed tool; a drawing spindle. Eventually it will be a series. For now a larger project is in the works (to be completed in May) so much of my studio time is spent spinning on the wheel. Oh, this is genius! I grew up with a mother who hand-spun a lot of her own yarns. It never occurred to me to spin with other mediums. This is really clever. I can't wait to see more work in this series. I'm also curious what the spinning tool looks like! 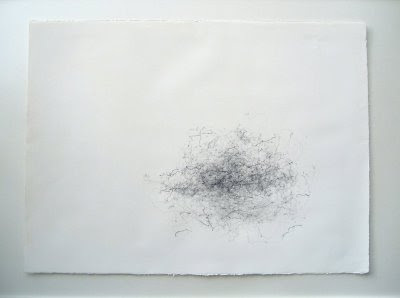 I love these spun drawings, they are amazing. 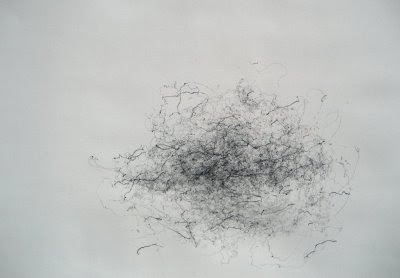 Fragile and strong, fleeting and present, gestural and disembodied. So dynamic. So tender. A strange kind of cloud that is on the point of becoming or dissolving. Beautiful! 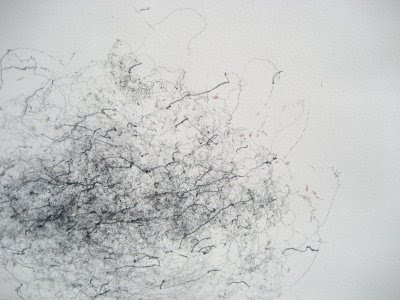 Gorgeous, I love this idea of using the spinning process to make the drawing. I once met an artist who made drummed drawings - he was very influenced by his love of music so he'd put on music and drum along using pencils on paper instead of his usual drumsticks on drums.